The triple camera has been the cornerstone of the Huawei P20 Pro marketing campaign, but concrete details have been scarce. The new camera, co-developed with Leica, may pack a 40MP sensor, the likes of which haven’t been seen since the PureView days. Here’s the breakdown. The 40MP sensor will serve as the primary camera. Next to it is an 8MP telephoto camera with “hybrid zoom”. According to unconfirmed info this cam will provide 3x optical zoom, which along with info from the 40MP sensor will help achieve high-quality 5x magnification. The third sensor will have 20MP resolution and will likely shoot in black and white as well as assist with bokeh effects. The triple camera will be assisted by Laser AF and an IR-RGB sensor. As for the slow-mo videos, the P20 will reportedly shoot 960fps at 720p (same as the Galaxy S9 phones). The Huawei P20 Pro will have a 19:9 screen with a notch, where a 24MP selfie camera will live. The screen should be a 6.1” OLED panel with 1,080 x 2,240px resolution. The body of the phone will reportedly measure a slender 7.65mm and weigh 175g, which is pretty good for a 4,000mAh battery. It will support Huawei’s SuperCharge at 22.5W. The battery will be charged over USB-C and there’s a bit of bad news here – the port will also need to handle headphones as the 3.5mm jack will be retired. Europe will likely get the P20 Pro version with 6GB of RAM and 128GB storage. The expected price of this model is €900, in line with competing flagships. 64GB and 256GB storage versions may be available in other regions. 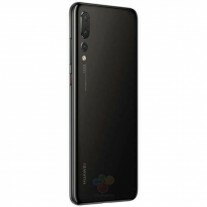 Huawei P20 Pro: black, blue, and "Twilight"
It shouldn’t come as a surprise that the phone will be powered by a Kirin 970 chipset and will run Android 8.1 Oreo with EMUI on top.